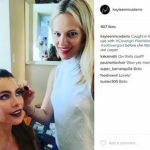 Kayleen McAdams did the makeup honors for the stunning Sofia Vergara tonight at at the SAG awards. Here, the beauty breakdown, courtesy of Kayleen. Retro Eyes: For this look I wanted to go for a more retro feel so I kept the eye heavier on the top with brown shadow from the CoverGirl truNaked Eyeshadow Palette in Nudes. Then I used Perfect Point Plus Eyeliner in Espresso with a bit of brown shadow on the bottom. To emphasize the look I used two coats of So Lashy BlastPro Mascara in Extreme Black on top, but just one coat of So Lashy in Black Brown on the bottom, a trick to keep the eyes looking soft. To really reach all of the lower lashes I used the specialized ball tip to ensure each lash was lightly coated with mascara. Bold Lips: As soon as I saw this dress I immediately wanted to do a bold red lip. I used the Outlast All Day Color & Gloss in Richest Red. This product has amazing staying power and will last for the entire show. Use a lip liner after applying the base color to lock in the color and then top with the gloss.